"Gifts" redirects here. For other uses, see Gift (disambiguation). "Presents" redirects here. For other uses, see Present (disambiguation). Modern engagement gifts basket in Bangladesh. A gift or a present is an item given to someone without the expectation of payment or anything in return. An item is not a gift if that item is already owned by the one to whom it is given. Although gift-giving might involve an expectation of reciprocity, a gift is meant to be free. In many countries, the act of mutually exchanging money, goods, etc. may sustain social relations and contribute to social cohesion. Economists have elaborated the economics of gift-giving into the notion of a gift economy. By extension the term gift can refer to any item or act of service that makes the other happier or less sad, especially as a favor, including forgiveness and kindness. Gifts are also first and foremost presented on occasions such as birthdays and holidays. In many cultures gifts are traditionally packaged in some way. For example, in Western cultures, gifts are often wrapped in wrapping paper and accompanied by a gift note which may note the occasion, the recipient's name and the giver's name. In Chinese culture, red wrapping connotes luck. Although inexpensive gifts are common among colleagues, associates and acquaintances, expensive or amorous gifts are considered more appropriate among close friends, romantic interests or relatives. An expression of coronation acknowledgement for national event Official coronation gift, Royal or Imperial commissioned by the coronation commission presented to the newly crowned monarch, as personal memento. American Jews give Hanukkah gifts to family and friends. Promotional gifts vary from the normal gifts. The recipients of the gifts may be either employee of a company or the clients. Promotional gifts are mainly used for advertising purposes. They are used to promote the brand name and increase its awareness among the people. In promotional gifting procedures, the quality and presentation of the gifts hold more value than the gifts itself since it will act as a gateway to acquire new clients or associates. Giving a gift to someone is not necessarily just an altruistic act. It may be given in the hope that the receiver reciprocates in a particular way. It may take the form of positive reinforcement as a reward for compliance, possibly for an underhand manipulative and abusive purpose. A significant fraction of gifts are unwanted, or the giver pays more for the item than the recipient values it, resulting in a misallocation of economic resources known as a deadweight loss. Unwanted gifts are often regifted, donated to charity, or thrown away. A gift that actually imposes a burden on the recipient, either due to maintenance or storage or disposal costs, is known as a white elephant. One means of reducing the mismatch between the buyer and receivers' tastes is advance coordination, often undertaken in the form of a wedding registry or Christmas list. Wedding registries in particular are often kept at a single store, which can designate the exact items to be purchased (resulting in matching housewares), and to coordinate purchases so the same gift is not purchased by different guests. One study found that wedding guests who departed from the registry typically did so because they wished to signal a closer relationship to the couple by personalizing a gift, and also found that as a result of not abiding by the recipients' preferences, their gifts were appreciated less often. An estimated $3.4 billion was spent on unwanted Christmas gifts in the United States in 2017. 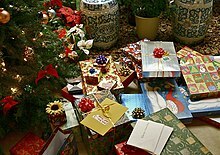 The day after Christmas is typically the busiest day for returns in countries with large Christmas gift giving traditions. The total unredeemed value of gift cards purchased in the U.S. each year is estimated to be about a billion dollars. In some contexts, gift giving can be construed as bribery. This tends to occur in situations where the gift is given with an implicit or explicit agreement between the giver of the gift and its receiver that some type of service will be rendered (often outside of normal legitimate methods) because of the gift. Some groups, such as government workers, may have strict rules concerning gift giving and receiving so as to avoid the appearance of impropriety. In the Eastern Orthodox Church, the bread and wine that are consecrated during the Divine Liturgy are referred to as "the Gifts." They are first of all the gifts of the community (both individually and corporately) to God, and then, after the epiklesis, the Gifts of the Body and Blood of Christ to the Church. ^ Brigham, John Carl (1986). Social Psychology. p. 322. ^ Braiker, Harriet B. (2004). Who's Pulling Your Strings ? How to Break The Cycle of Manipulation. ISBN 978-0-07-144672-3. ^ a b Lee, Timothy B. (December 21, 2016). "The economic case against Christmas presents". Vox. Retrieved December 5, 2017. ^ Mendoza, Nohely (December 26, 2017). "New Study Explores Psychology Of Giving Wedding Gifts". Nexstar Broadcasting. Waco, Texas. ^ a b Mendoza, Nohely. "Biggest return day of the year". Nexstar Broadcasting. Waco, Texas. Retrieved September 19, 2018. ^ Musaddique, Shafi (January 2, 2018). "Unwanted Christmas presents set to rise on busiest day of the year for returns". The Independent. Retrieved September 19, 2018. ^ "Gifts and Payments". Washington, D.C.: United States Office of Government Ethics. Retrieved September 19, 2018. This page was last edited on 19 March 2019, at 01:40 (UTC).